Dawn chorus featuring American Robin, Willow Flycatcher, Song Sparrow, and Red-winged Blackbird. Recorded June 28, 2012 Canaan Valley NWR, West Virginia. ©Wil Hershberger. As May waxes on, the woodlands, fields, and thickets seemingly explode with the songs of birds. From the relative quiet of winter, the presence of all these songs is a retreat for the soul. The exuberant announcements, at the beginning of the day, that each male has survived the night unfold as the dawn chorus. He is singing to let his mate and his neighbors know that he is still there and will defend his territory. As the sun rises, this dawn chorus spreads ever farther west, like a tidal wave of song ushering in the new day. At any time of year there is a dawn chorus happening somewhere on the planet. Either in the Northern hemisphere or the Southern, there is always a dawn chorus rushing westward before the sun. Their old, melodious madrigals of love! So why make all this sound? It seems like it would draw undo attention from predators to the singer. Chemical signals are stealthy, however they are subject to the wind and cannot travel very far. A visual signal would really expose the signaler to predation. Producing a sound allows the singer to either remain hidden or to be exposed, and song will radiate out in all directions. Different environments require the singer to produce different types of sounds. Low pitched, long notes travel better in dense vegetation. High pitched, short notes can be heard farther in open habitats. 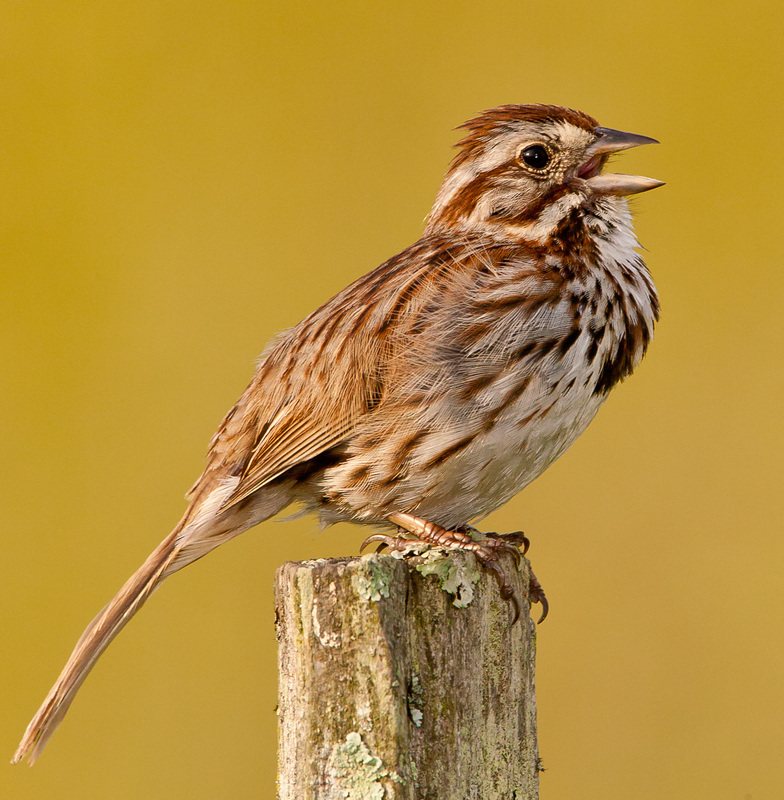 In order to be heard, different species have evolved different singing strategies for the habitats in which they live. Some species are very much like humans; they learn the sounds that they produce from adults of the same species. These are the learners, the songbirds, they have an innate pattern of what the song should sound like, but they must learn the fine structure of the song from adults and how to produce those notes through practice. Young songbirds babble just as human babies do. At some point they start to produce notes that sound very adult like, just as a baby human will start to say a word or two. Then the young bird will start to string these well-formed notes into song elements, just like short sentences. Then he stops practicing out loud and falls silent for the winter months. As spring arrives he resumes his practicing, comparing what he is singing with the templates that he memorized from the males he heard the summer before. Soon, he will be singing adult songs, crystallized song, and setting up his own territory in the area where he was listening to the singing males that first summer. A very young Song Sparrow babbling as he first begins to practice making sounds. Recorded on October 17, 1999. ©Wil Hershberger. A young Song Sparrow babbling and creating some Song Sparrow sounding notes. Recorded on February 23, 1997. ©Wil Hershberger. A young Song Sparrow still practicing his songs. He is starting to produce more song elements that are typical for adult Song Sparrow Song. Recorded on March 5, 2000. ©Wil Hershberger. A young Song Sparrow starting to sing more and more adult-like song elements. Recorded on March 20, 1999. ©Wil Hershberger. An adult Song Sparrow singing a lovely song with fully formed song elements in a woodland in upper Minnesota. Recorded on June 7, 2013. ©Wil Hershberger. Other species of birds do not learn their songs from adults. Their songs are somehow encoded within their DNA. They have a genetic predisposition to produce the songs of their species. If you were to take a very young, just hatched male of one of these species from its nest and raise it in isolation, it would eventually sing a very good rendition of that species song. This has been done with Eastern Phoebes; these isolated males will sing the typical phoebe song even though they have never heard another adult singing while growing up. The song of the Eastern Phoebe is somehow encoded in his DNA. He will sing a perfect retention of his species specific song whether he hears it or not as he is growing up. Recorded April 3, 2014. ©Wil Hershberger. Originally published in Valley Views, the newsletter of the Potomac Valley Audubon Society. Hi there! I am a naturalist, writer, nature photographer/videographer and natural sounds recordist. I have been interested in the natural world all my life. I am excited about bringing The Miracle of Nature to the world as a premier web site for the sharing of information and inspiration of the world of natural sounds. Learn more about me at Nature Images & Sounds and Google+.